Ginisang Munggo (Filipino Sautéed Mung Beans) is a wonderful “ulam” (dish that goes with rice) during rainy and cold days. Dish starts with the classic Filipino holy food trinity which consist of garlic, onions and tomatoes and ends with the addition of chili leaves. The chili leaves gives that peppery taste that blends well with the slightly thickened flavourful broth. 1 Place the mung beans, water and salt in a large saucepan and bring to a boil for 30 minutes or until the beans are tender. Drain the beans and set aside. 2 In another large saucepan, heat the oil and brown the pork. Drain and set the pork aside. 3 In the same saucepan, stir-fry the garlic until golden brown, then stir-fry the onion until translucent. Add the tomatoes and cook until they soften. 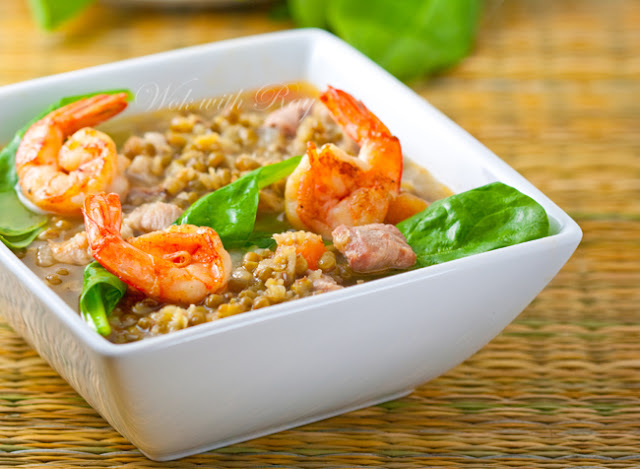 Add the mung beans, stock and fermented shrimp, mix well and bring to a boil. 4 Reduce the heat and add the bitter melon leaves or spinach, and cook until just tender, about 3 minutes. Add the cooked pork, season with the pepper and stir to mix well. Serve hot.